Counterfeiting is predicted to drain US $4.2 trillion from the global economy by 2022, and can negatively affect virtually every economic sector, often with fatal consequences. Not only is currency a target for counterfeiting, but also pharmaceuticals, legal documents like bank notes, high-priced art, historical artifacts, consumer electronics, and even wearable apparel and accessories. 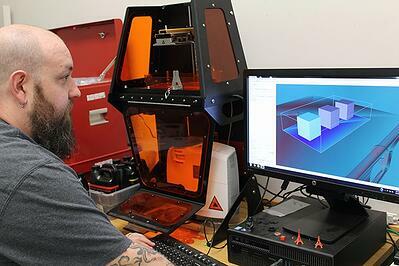 In response, huge steps are being made by South Dakota School of Mines and Technology researchers and professors through the use of a B9Creations 3D printer. The Center for Security Printing and Anti-Counterfeiting Technology (more simply, SPACT), powered by the hands of research facilities in three South Dakota research universities and utilizing B9Creations technology, has revolutionized the way that security-end products are handled. SPACT has even been recognized at the global level for proof-of-concept in use of upconverting nanoparticles in quick response (QR) codes, printed with B9Creations technology in a method they refer to as 2.5D printing.1 These printed upconverting codes - which are invisible to the naked eye but appear under infrared light - can be used to determine authenticity; reducing counterfeiting and maintaining the legitimacy of products that may be protected. 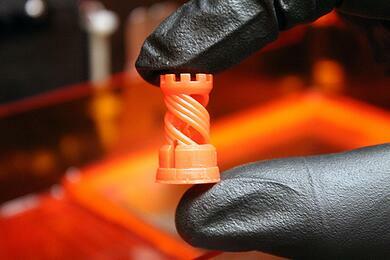 What are upconverting nanoparticles and what is 2.5D printing? A nanoparticle is a particle that is usually used to refer to inorganic materials between 1 and 100 nanometers in size (100,000 nanometers = the width of a human hair). In SPACT's case, the nanoparticles they are using are those of rare earth metals and other chemicals. This word nanoparticle, though, takes on a more significant meaning when tied to the concept of upconversion. These nanoparticles are not visible in natural light with your naked eye. Once illuminated by an infrared light, though, these nanoparticles are upconverted; and emit photons at a different wavelength than the illuminated one. The upconverted excitation lights up the nanoparticles and shares information about the particular piece that isn't attainable otherwise. When an infrared light shines on a printed QR code (or any other piece) that has upconverting nanoparticles integrated into it, the codes can then be read by any standard QR code reader. But when there's no infrared light? Nobody will really know what vast information the QR code may hold, because it's impossible to see. Through this technology, there's vastly reduced potential for counterfeiting this, as a piece is able to contain its own unique identification information. 2.5D printing is a mixture between 2D printing and 3D printing in which a resin 3D printer is manipulated in order to print only a single layer of a part. Because a single layer can be as small as 30 microns, it's impossible to see but perfect for printing with nanoparticles that mix in seamlessly with the resin. Why would you use upconverting nanoparticles in QR codes? QR codes already hold 100 times more information than bar codes. Pair this with upconverting nanoparticles and the unique B9Creations printing method, and this amplifies the QR code's ability to contain a vast storage of information. This information stored through a QR code could tell the intended recipients boundless information -- from the history and description of a piece, like a historic artifact, to the implications or applications of a piece, like pharmaceutical packaging. But if an invisible QR code is printed on a piece itself, this information can be linked to the piece without compromising its integrity. The manufacturer's name, origin, date, and other valuable information can protect the item from being fraudulently copied or used, even in the future. And the best part of it all? The piece will remain exactly the same to the viewers, with an arsenal of protection and safety hidden on it in plain sight. Even more information can be stored in the QR code, including letters that can only be read with a microscope. The researchers have even experimented with a combination of characters, symbols, and different colors using upconverting nanoparticles that show up green and blue to vary complexity and security. Given their mutual interest in cutting-edge technologies, B9Creations and SPACT were natural partners. The upconverting nanoparticles can be integrated into the B9Creations resin (like in the rook pictured on the right!). The high resolution and versatility allow for alteration to the QR codes, and the addition of letters and microscopic details add more security to the information-heavy 3D printed codes. 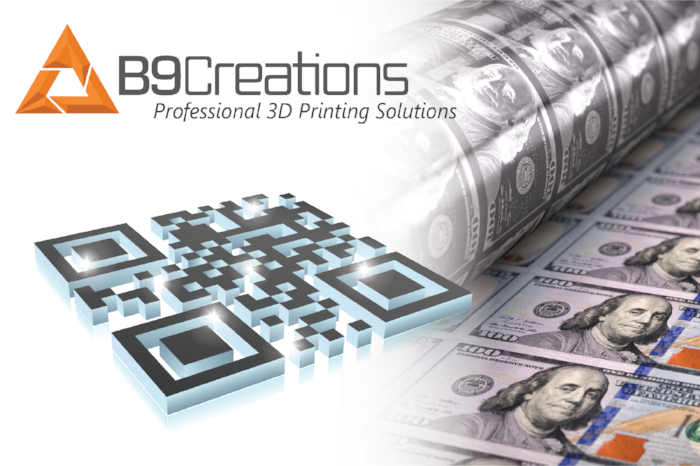 Additionally, these QR codes can be printed on paper, plastic, or glass, so their use can extend beyond protecting currency. What market opportunities could this provide? Protecting intellectual property is one of the largest problems of living in a technological age. With counterfeiting becoming more attractive because of higher costs for genuine products and easier because of technological advancements allowing for replication, it's becoming more important than ever for businesses and resellers to guarantee their legitimacy. Luckily, the implications can be managed and reduced through the use of cutting-edge B9Creations technology adapted to act as anti-counterfeiting technology. If the legitimacy of a product is at risk because of counterfeiters, like a historic artifact, currency, or pharmaceutical drug, precautions could be put in place with the use of these 2.5D or 3D printed pieces. When an extremely valuable painting is in transportation or arrives at a new location, the handlers could check the information given through the QR code and upconverted nanoparticles in order to track the piece and make sure it is the same piece that was promised. Bank notes and currency can be initiated and tracked with details on place of origin in order to fuel the economic sector without deception. And all this can be done without leaving an intrusive mark. As the initial intention of this research begins to unfold and work together, B9Creations will be working with SPACT to explore other opportunities for this application. With new markets and insights aligning through the collaboration between these two workforces, upconverting nanoparticles, QR codes, and 3D printers have an exciting future ahead and could pioneer an integral anti-counterfeiting strategy, potentially halting the $4.2 trillion counterfeiting problem in the United States today. J. Petersen, P.S. May, A. Baride, J. Meruga, G. Crawford, T. Kobayashi, M. Jensen, W. Cross, J. Randle, and J. Kellar, “Security Printing Applications Inspired from Nanotechnology”,. In Optical Document Security Conference, Reconnaissance International, 2018.